Location: South side of Yan'an Zhong Lu; ten minutes walking from two nearby subway stations. 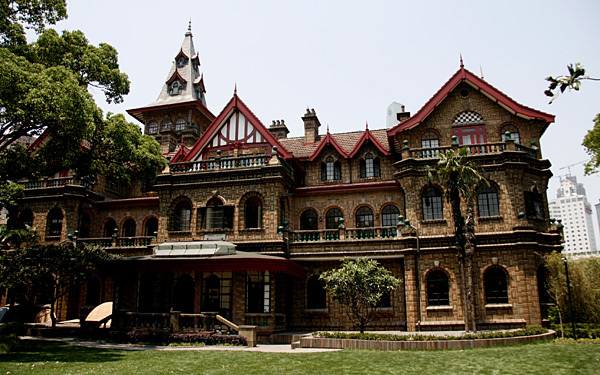 Of Shanghai's many colonial-era mansions, the Moller Villa on the northwestern edge of the French Concession stands out with its fantasy of brown-tiled Gothic and Tudor steeples, gables, and spires. It was built by a Swedish shipping magnate, Eric Moller, in 1936. On May 11, 2009, together with two of my Finnish friends, I entered the storybook castle and tried to unravel the fact from the fantasy. Legend has it that Jewish Eric Moller came to Shanghai in 1919 empty-handed and made his fortune here by winning large sums at the horse races, culminating in the construction of this fantasy home for his daughter. The daughter is said to have had a dream in which she saw a castle like those in the Hans Andersen fairy tales. On awakening, she drew a sketch. The father was so fond of his youngest daughter that he immediately commissioned an architect to build her dream house. Looking at the Gothic fantasy, unique in comparison to other old buildings in the French Concession, the tale seems so convincing. But, as it turns out, it is as fantastic as the villa. Tina Kanagaratnam from the local newspaper Shanghai Daily has documented the truth about the house. Architectural historian Tess Johnston, the co-author of A Last Look: Western Architecture in Old Shanghai met Moller's daughter in the summer of 1992, and reported that she "stated categorically that there was not a shred of truth" in the tale. In reality the Mollers were originally Swedish with British citizenship. Eric Moller was the son of wealthy businessman Nils Moller, who had started a business in Hong Kong in the 1860s. The business grew and expanded into eight cities in China, and although the Mollers left Shanghai in 1950, their companies continued operating in Hong Kong into the 1990s. The core of the family business was shipping and shipbuilding, and in Shanghai, the Moller portfolio included shipping lines, insurance, real estate and investment. In 1913, Eric Moller took over the family business and prospered. He had a steamboat that ran between Shanghai and Zhenjiang in Jiangsu Province, and, in the mid-1920s, decided to embark on the construction of a house for his big family – six children and a menagerie of dogs and cats. In 1927, a Shanghai architectural firm, Allied Architects, delivered the blueprint, and the house was essentially finished in 1936. The combination of a distinctly Scandinavian style with architectural references to ships throughout the house hints that Moller was probably heavily involved in the design. 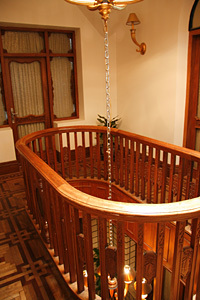 The decorative round windows by the stairs, the sealing windows, and an oval railing fence on the third floor reminiscent of a steering cabin; all signify a shipping theme in the architectural detailing. 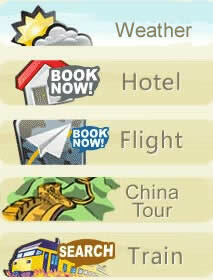 Besides its Scandinavian features, there are some Chinese touches. The enclosing walls had Chinese glazed tiles at the top. Two stone lions stood at the front gate. Inside were Chinese designs and patterns and many Chinese antiques. Moller was a horseracing fan and the chair of the Shanghai Horse Racing Club. His beloved horse Blonic Hill, an Arab stud stallion, brought him money and honor in the racing field. In memory of his horse, Moller built a tomb to Blonic Hill that stood on the lawn of the garden. 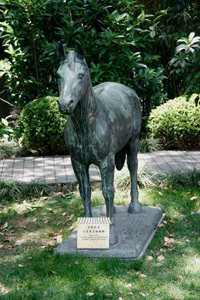 Now only the bronze statue of the horse remains. Later, after the funeral of the horse, the family's dogs and cats joined the statuary. The story is that there was another bronze dog but it was lost during the Cultural Revolution (1966-1976). We did find a stone dog in the garden, and the hotel manager told us it was the very dog that Moller had raised. It was said that a fortune-teller told Moller that if he ever finished the house, ill-fortune would befall him. So Moller dawdled, adding bits and bobs for more than 10 years, finally completing the task in the late 1940s. According to Johnston, Moller's daughter said that the fortune-teller tale too is false, but there is no doubt that Moller's fortunes took a turn for the worse following the breakout of World War II.